Stealing someone’s beloved car is such a scumbag move. But unfortunately, it happens. 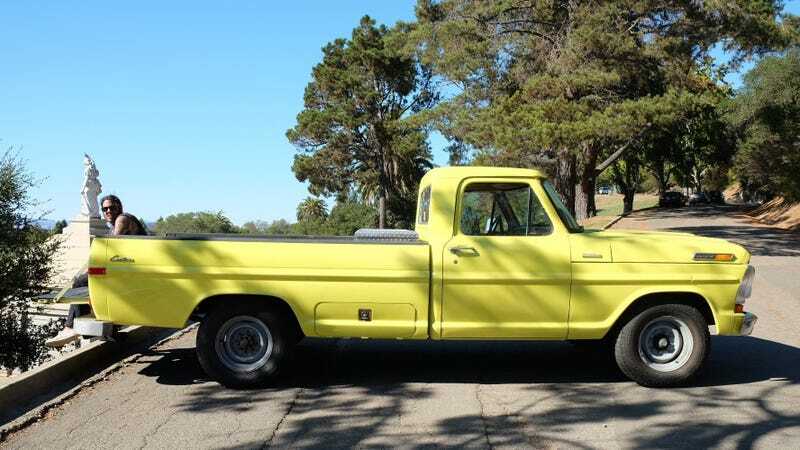 This time, the owners of a wonderful, yellow 1970 Ford F-250 Camper Special are distraught over the truck’s disappearance. Let’s see if we can help them find it. “Yellow Betty” was stolen from outside of its owner Roy’s San Francisco apartment this weekend. Roy’s mechanic and friend, Owen, reached out to us and said that they’d spent the last few years fixing up the truck and keeping it road-worthy. This summer, they spent two months of weekends fixing up the body and rust and had it sprayed with a fresh coat of yellow paint. Then, sometime during the night this weekend, the truck was heisted from the front of Roy’s apartment at 21st and Church Street in San Francisco. Owen suspects that it was a professional job, since they didn’t find any glass on the street. But he hopes that since the truck is so distinctive, someone will see it and recognize it. Clearly, a lot of love went into this truck. Jalopnik sleuths, can we do it? Can we track down this truck? Anyone with information is encouraged to call (415) 413-0744 or the San Francisco Police Department at (415) 553-0123. Update Oct. 19, 2:37 p.m. EST: The truck has been found! Thanks to tips on Facebook and Nextdoor, Yellow Betty’s owners were led to the Leona Heights area near Highway 13 in Oakland. It was just parked on a corner in a residential neighborhood. Owen said that besides a busted ignition and some stolen tools and accessories (like the window cranks, for some odd reason), the truck is unhurt. There isn’t even any damage to the new paint. Here’s the photo from when they found it. Yay!